Also, I explained the third method of grounding design calculations: Excel Spreadsheets Method in Article " Grounding Design Calculations – Part Four ". And I explained the forth method of grounding design calculations: By using Tables In Articles " Grounding Design Calculations – Part Five " and " Grounding Design Calculations – Part Six ". 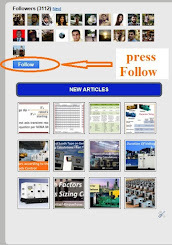 Today, I will continue explaining the fifth method of grounding design calculations: Online Earthing Calculators Method. In Article " Grounding Design Calculations – Part Seven ", I listed the online Earthing calculators that will be introduced and explained help electrical designers in grounding design calculations. These (3) earthing calculators providers provide (6) online earthing calculators that will be explained herein. Before using any online earthing calculator, you must check its compatibility with your local codes and standards. This calculator will determine the total resistance to earth for multiple, equally spaced, vertical electrodes. The resistance can be calculated from either shallow or deep electrodes operated in parallel with correction for mutual interference between systems. This calculator employs the surface and deep electrode equations developed by Erling D. Sunde and found in his book Earth Conduction Effects in Transmission Systems. In the case of multiple electrode holes or electrode systems, correction for the mutual interference between the electrodes is accomplished using the general formula developed by Sunde. These equations apply to equally spaced, vertical electrodes placed along a straight line. Development of the equations assumed a homogeneous electrolyte with a single resistivity. The equations ignore any attenuation effects along the grounding electrode. Finally, although the equations were derived for direct current flow, they may be used for low frequency alternating current systems and even lightning surge resistance if the length of interconnecting wire is relatively short (less than 100 meters). As the lengths of interconnecting wires become greater in AC systems, the impedance of the wires becomes more significant and should be taken into account. 1- Choose Metric or English units by use of the input unit select button (beside the calculate button) prior to entering variables. The English units are feet and inch while the Metric units are meter and cm. Do not use commas in the input values. If the decimal is not entered, it is assumed to be just to the right of the right-most digit entered. 2- Enter the average resistivity of the environment (earth) around the grounding electrode in ohm-cm.This is the value of soil resistivity determined though field testing. Soil resistivities may vary from a low of 100 to a high of 1,000,000 ohm-cm. Regardless of the input units selected (English or Metric), the units for resistivity must be in ohm-cm. 3- Enter the length of a single grounding electrode or electrode column in meters or feet. If LORESCO grounding backfill is used, the length is the length of the backfill column. If no backfill is installed, the length is the actual electrode length. Where several electrodes are installed in a single hole, enter the length of the grounding backfill column, if used , or the total length of all of the individual electrodes, if no backfill is used. Multiple electrodes in a single hole are considered a single electrode. 4-Enter the total number of electrode holes installed. This is the number of LORESCO grounding backfill columns. Regardless of the number of electrodes installed in a single hole or grounding backfill column, this is considered one electrode. 5- Enter the diameter of a single electrode or electrode column in centimeters or inches. Again, this is the diameter the LORESCO grounding backfill, if used, or the actual electrode diameter, if no backfill is used. 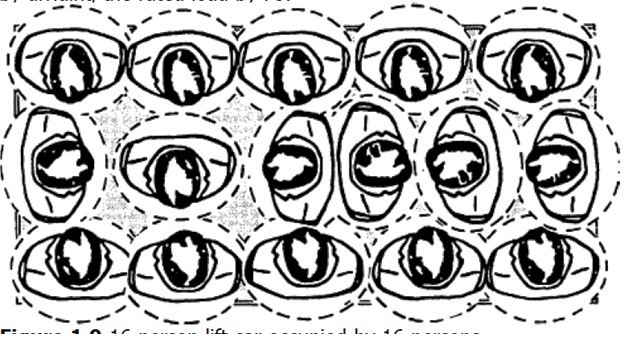 6- Enter the center-to-center spacing between individual electrode holes or columns in meters or feet. Typical spacings between surface electrodes vary between 1.5 to 10 meters (5 to 30 feet). Typical spacing between deep electrode systems vary between 7 to 30 meters (25 to 100 feet). 7- Select one of the two choices from the drop-down menu (Deep or shallow). Surface electrodes generally are installed with the top of the active electrodes within 15 meters (50 feet) from the surface. Deep electrodes are generally installed with the top of the active electrode below 15 meters (50 feet) from the surface. 8- Result: click on the Calculate button, You will get the resistance-to-earth in ohms of the electrode system described by the input data. If the estimated resistance is higher than the required value, one or more of the design variables may be changed in order to determine its effect on the expected resistance. The greatest decrease in resistance is achieved either by increasing the number of grounding electrode holes or increasing the length of a single electrode column. 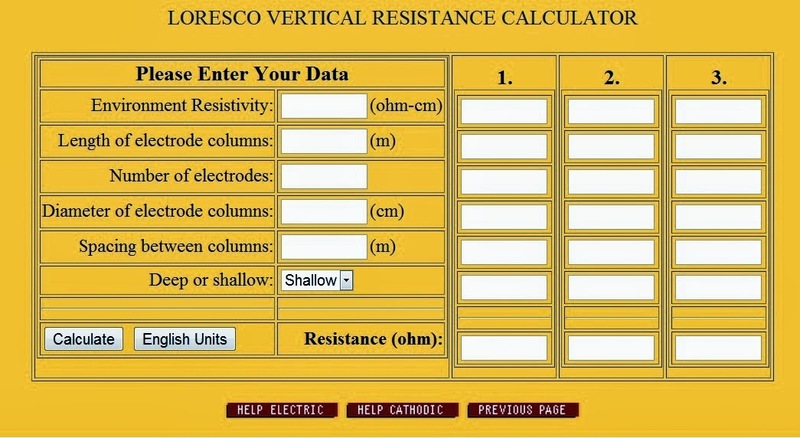 You can use the Loresco Vertical Resistance Calculator by click on the link. This calculator employs horizontal electrode equations developed by Erling D. Sunde and found in his book Earth Conduction Effects in Transmission Systems. Development of the equations assumed a homogeneous electrolyte with a single resistivity. The equations ignore any attenuation effects along the grounding electrode system. Although the equations were derived for direct current flow, they may be used for low frequency alternating current systems and even in estimating lightning surge resistance if the length of interconnecting wire is relatively short (less than 100 meters). As the length of the grounding electrode or interconnecting wires become greater in AC systems, the impedance (inductance) becomes more significant and should be taken into account. 3- Enter the length of the grounding electrode in meters or feet. If LORESCO grounding backfill is used, this is the total grounding backfill length. If grounding backfill is not used, this is the length of the electrode itself. 4- Enter the depth from the surface of the earth to the center of the horizontal grounding electrode in meters or feet. 5- If the electrode shape is cylindrical, enter the diameter of the electrode or electrode backfill column in centimeters or inches. This is the diameter of the LORESCO carbon backfill column, if used. If no backfill is used, this is the diameter of the electrode itself. If the electrode shape is rectangular, enter the width of the electrode or electrode backfill column in centimeters or inches. This is the width of the LORESCO carbon backfill column, if used. If no backfill is used, this is the width of the electrode itself. 6- If the electrode shape is rectangular, enter the thickness of the electrode or electrode backfill column in centimeters or inches. This is the thickness of the LORESCO carbon backfill column, if used. If no backfill is used, this is the thickness of the electrode itself. 7- Choose one of the two horizontal electrode shapes from the drop-down menu. This refers to the cross-sectional shape of the LORESCO grounding backfill column, if used. If grounding backfill is not used, this is the cross- sectional shape of the grounding electrode itself. If the estimated resistance is higher than the required value, one or more of the design variables may be changed in order to determine its effect on the expected resistance. The greatest decrease in resistance is achieved by increasing the length up to the point where attenuation along the single electrode becomes significant. Once attenuation becomes significant, additional horizontal electrodes are desirable. In the case where the electrode shape is chosen as rectangular, Sunde's equation for a horizontal strip electrode is used if the width is greater than eight (8) times the thickness. If the width is less than eight (8) times the thickness, an equivalent diameter is calculated for the electrode by determining the diameter necessary to equate the surface area for the rectangular electrode and a cylindrical electrode. Then, Sunde's equation for a horizontal cylindrical electrode is used assuming this equivalent diameter. Of course, if the electrode shape is chosen as cylindrical, Sunde's equation for a horizontal cylindrical electrode is used with the diameter entered. These equations apply to a single, continuous horizontal electrode. If the horizontal electrode system consists of multiple horizontal electrodes either placed in individual LORESCO grounding backfill columns rather than a single continuous backfill column or without grounding backfill, the calculator cannot determine the exact resistance-to-earth. However, the resistance may be estimated as follows. Calculate the resistance assuming the Length of the electrode is the length from the beginning of the first electrode or electrode backfill column to the end of the last electrode or electrode backfill column (In other words, the total end-to-end length of the system). Next, calculate the resistance assuming the Length of the electrode is the sum of the individual electrodes or electrode backfill columns (The space between the electrodes or electrode backfill columns is subtracted from the total end-to-end length). The actual resistance will be between these two calculated values. You can use the Loresco Horizontal Resistance Calculator by click on the link. 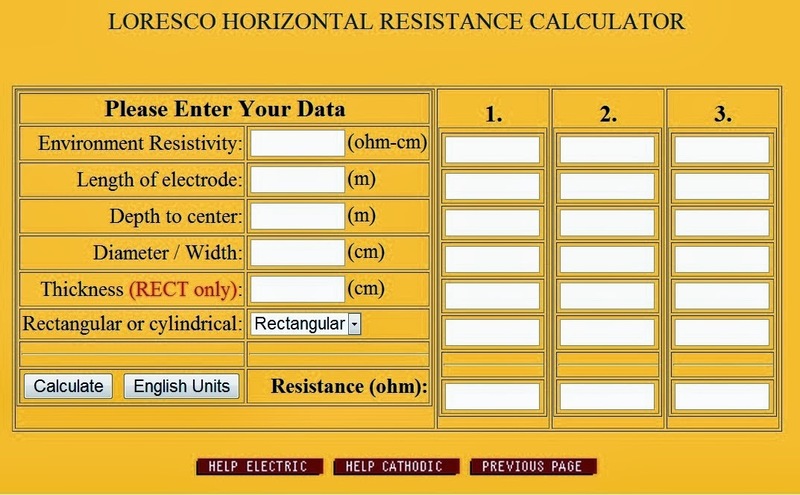 This calculator employs the techniques of estimating the resistance to earth of a grounding grid either with or without the attachment of vertical ground rods as described in ANSI / IEEE Standard 80. The specific equations used were developed for uniform soil resistivity by S. J. Schwarz and published in his paper titled, "Analytical Expressions for Resistance of Grounding Systems", AIEE transactions, vol 73, part III-B, 1954, pp 1011-1016. The resistances of the grid and vertical rods are combined using resistance equations developed by R. Rudenberg ("Grounding Principles and Practices – 1, Fundamental Considerations on Grounding Currents." Electrical Engineering, vol 64, no 1, Jan 1945, pp 1 – 13.) and E. D. Sunde (Earth Conduction Effects in Transmission Systems. New York: McMillan, 1968.). The two layer model used is based on work by C. J. Blattner in his paper "Study of Driven Ground Rods and Four Point Soil Resistivity Tests. "IEEE Transactions on Power Apparatus and Systems, vol PAS-101, no 8, Aug 1982, pp 2837 – 2850. Finally, the constants related to the geometry of the system are determined by expressions developed by S. W. Kercel in his paper "Design of Switchyard Grounding Systems Using Multiple Grids." IEEE Transactions on Power Apparatus and Systems, vol PAS-100, no 3, Mar 1981, pp 1341 – 1350. 2- Enter the total length of the grid conductors in meters or feet. 3- Enter the average length of the ground rods or the grounding backfill columns, if used, in meters or feet. If a grounding backfill column is used, you should enter the total length of the backfill regardless of the length of the ground rod or contacting electrode within the backfill. 4- Enter the average resistivity of the upper layer of soil around the grounding grid in ohm-cm. This is the value of soil resistivity from the surface to a depth of H as determined though field-testing. 5- Enter the average resistivity of the deeper layer of soil around the grounding electrode in ohm-cm. This is the value of soil resistivity from the depth of H downward as determined though field-testing. Soil resistivities may vary from a low of 100 to a high of 1,000,000 ohm-cm or more. 6- Enter the diameter of the grid conductors in centimeters or inches. If Loresco grounding enhancement backfills are used around the grid conductors, enter the equivalent diameter of the backfill. 7- Enter the diameter of a single ground rod or of a backfill column, if used, in centimeters or inches. Again, this is the diameter the LORESCO grounding backfill, if used, or the actual electrode diameter, if no backfill is used. 8- Enter the total number of ground rods installed. If Loresco grounding backfill columns are used, enter the number of backfill columns. Regardless of the number or type of electrodes installed in a single hole or grounding backfill column, this is considered one rod. 9- Enter the depth of burial of the grid in meters or feet. If the grid is laying on the surface of the earth, you may enter zero. 10- Enter the thickness of the upper soil layer in meters or feet. If the soil resistivity is uniform to a depth equal to or greater than the average rod length, a single soil resistivity layer model is used. In this case, you must enter the value of the upper soil resistivity for both the upper and lower resistivity values required and enter any number for the Thickness of the Upper Layer, H. In order for the two layer model to be valid, the thickness of the upper layer should be at least 10% of the long-side grid length. Finally, the thickness of the upper layer, H, must be greater than or equal to the grid depth and less than or equal to the average ground rod length. 11- Enter the length of the short side of the rectangular area covered by the grid. 12- Enter the length of the long side of the rectangular area covered by the grid. 13- Result: click on the Calculate button, you will get the resistance-to-earth in ohms of the electrode system described by the input data. If the estimated resistance is higher than the required value, one or more of the design variables may be changed in order to determine its effect on the expected resistance. 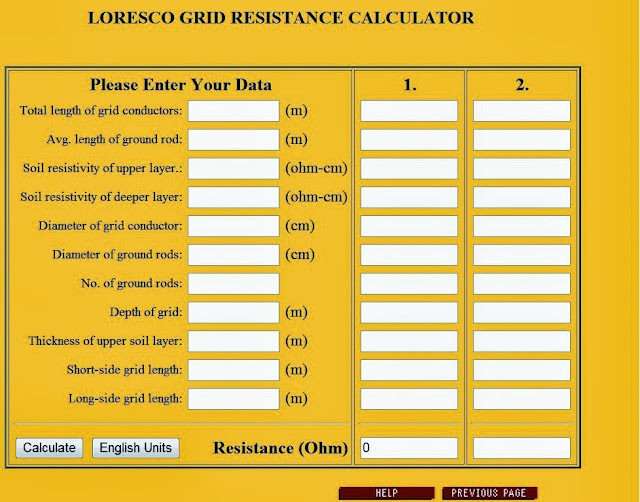 You can use the Loresco Grid Resistance Calculator by click on the link. 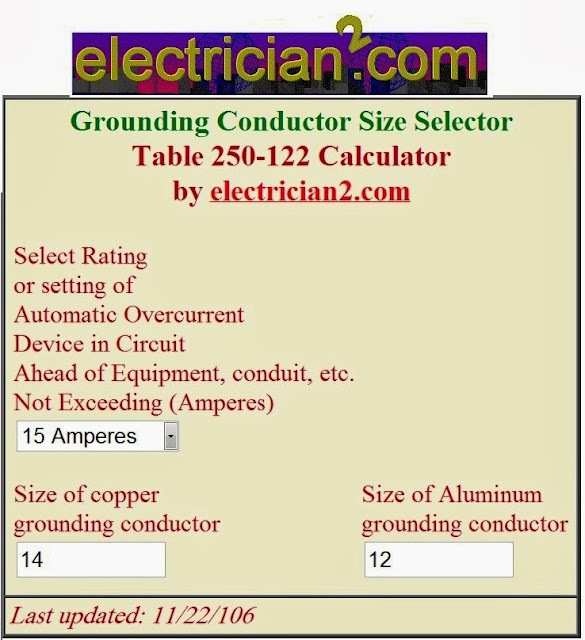 Equipment Grounding Conductor Size Calculator. This program reads NEC Table 250.66. Select the size of largest copper service entrance conductor or equivalent area for parallel conductors from the list or select size of largest aluminum service entrance conductor or equivalent area for parallel conductors from the list and this program finds the sizes of either the copper or aluminum equipment grounding electrode conductors. This program reads NEC Table 250.122. Select the overcurrent protective device from the list that includes the standard overcurrent protective device sizes from Section 240.6(A) and this program finds the sizes of both the copper and aluminum equipment grounding conductors. You can use the Electrician2 Grounding Calculators by click on the link. In the next Article, I will explain the Sixth Method of Grounding Design Calculations: Software Programs Method. Please, keep following.